For many patients, there is a high risk of injury resulting from limbs becoming caught in the side rails of a bed. 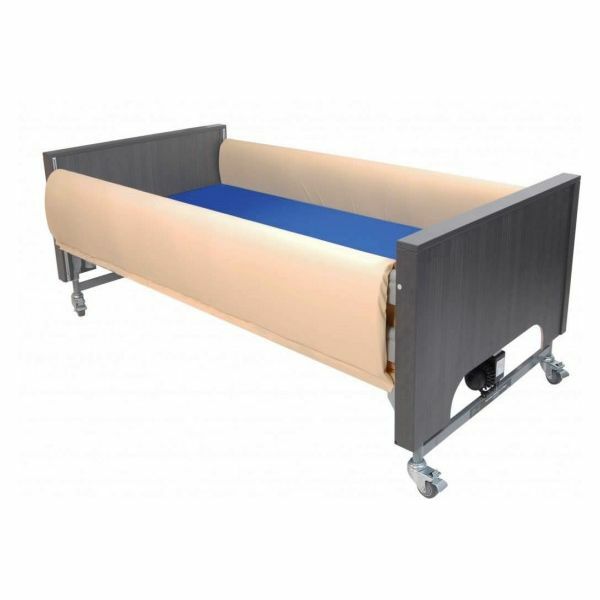 The Harvest Folding Side Rail Bumpers (360 x 2000mm) are designed to prevent this, protecting a patient's limbs from getting caught within the bed rails and softening any impact between body and rail. This product is especially effective for those at high risk of entrapment, in particular patients with senility or Alzheimer's disease. These bumpers are made to fit adjustable telescopic bed rails, providing a soft and safe sleeping area for the patient. Equipped with foam filled inners, these folding bumpers offer great patient protection at a very reasonable price. The Harvest Folding Side Rail Bumpers are supplied with a two-way stretch vapour-permeable cover which allows them to breathe while protecting them from any spillages or urine. Please note that while the side rail bumpers are shown in the image above attached to a bed, this product includes the bumpers only.